It can be an itchy, scratchy world for eczema sufferers! Eczema is a chronic inflammatory skin condition that leads to red, irritated, cracked and swollen skin. It tends to run in families and is associated with allergies and asthma. Topical steroid creams are the mainstay of treatment in conventional medicine. These creams are strong and work well to give symptomatic relief, however if you are not working to correct the underlying imbalance, symptoms tend to return. Naturopathic treatment is more than skin deep and works to treat the cause of imbalance. While it is not a quick fix, these treatments can help to restore balance in the body for lasting results. This is especially important for young children to prevent the development of asthma down the road. Both of my kids have experienced eczema, my youngest as early as 2 months old. As a naturopathic doctor, I felt that topical steroid creams were not sufficient as a long term solution. Our family worked hard to understand the triggers for each child, and to nourish their immune system into balance using nutrition and natural medicine. While eczema is a genetic condition, it is the environmental factors that can turn these genes on or off. Eczema is a sign of imbalance in the immune system and the triggers can be related to allergies, food sensitivities, gut health, nutrient deficiencies or stress. Eczema can be triggered by food allergies or environmental allergens such as dust, animal dander or pollen. 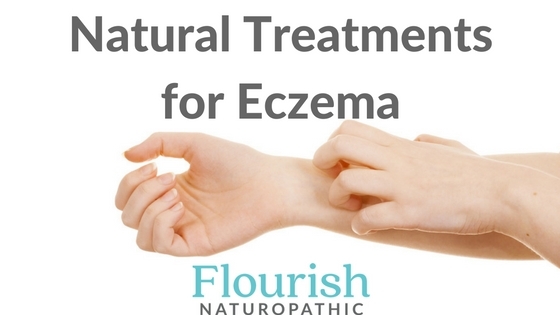 If you suspect that these are the cause of your eczema you can work with a naturopathic doctor, medical doctor or allergist to investigate further. Naturopathic doctors can also test for IgG food sensitivities that can promote chronic inflammation and exacerbate eczema. Common food sensitivities include dairy, wheat, peanuts, beef, eggs, soy and citrus. An anti-inflammatory diet rich in omega oils, beta carotene, vitamin C, zinc and antioxidants will nourish the immune system and promote a stronger skin barrier. Include nutrient rich foods such as salmon, avocado, olive oil, coconut oil, flax, hemp hearts, pumpkin seeds, bright colored veggies, blueberries and bone broth. Supplement the diet with Omega 3 EFA’s and vitamin D.
Digestive health is extremely important in inflammatory conditions, as the majority of the immune system surrounds the gut. Probiotics have proven to be an important natural treatment for eczema. Supplement with high quality probiotics, eat fermented foods and only take antibiotics if absolutely necessary. For some individuals stress can be a major trigger for eczema. Elevated stress hormones upset the immune system and promote inflammation. Manage stress through self-care and healthy lifestyle habits. If necessary, support the adrenal gland with adaptogenic herbs such as Reishi Mushroom or Astragalus. Individuals with eczema have a compromised skin barrier which makes skin sensitive to various topical exposures. Opt for natural skin care and watch for triggers such as laundry detergent, soap (which is drying for the skin) and chlorine. Choose breathable fabrics, especially when it comes to kids pyjamas. Moisturize the skin regularly with a natural moisturizer or coconut oil. Natural medicine creams are available which can help to reduce inflammation, reduce risk of infection and promote healing. My favorite ingredients to look for include ostrich oil, sea buckthorne oil, neem oil and calendula. It is ideal to work with children during the early years as their immune system is still developing. Our goal is to help children heal from eczema, and also prevent the development of asthma and allergies down the road.